Recently, my Sunday School friend, Sara, made this for our Christmas party. I LOVED it! Sara found the recipe at Jamie Cooks It Up! I visited Jamie's blog. She has some great family recipes! I especially love Jamie's humor and her description of chopping up the cranberries - check it out! I love the sweet and savory of this Cranberry mixture so I decided to call it a salsa. I divided the recipe and served it over one block of cream cheese on two separate occasions. This recipe wasn't difficult. I could see.... just keeping this in my fridge over the holidays so I would always have an appetizer on hand. I think I would love this on a turkey sandwich, too! Yummo - give it a try - plus it looks so pretty!! Using a food processor (I used my Ninja), chop the cranberries to your desired consistency. I liked mine in small pieces. Add rest of the ingredients (except cream cheese) and mix well. Store in an airtight container for at least 4 hours or over night. Don't omit this step as the cranberries need to absorb the sugar and soften and sweeten with time. When ready to serve, take a softened cream cheese and spread evenly with a knife over a platter or dish, creating thin layer. 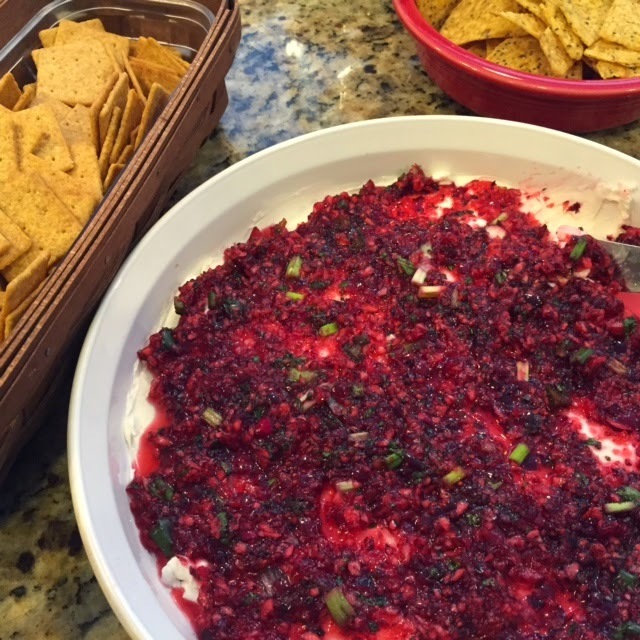 Top with desired amount of cranberry salsa. Serve with Wheat Thins, favorite cracker or tortilla chips!